To be locked up alone in a church tower or to be fully engulfed in the spotlights during a Rieu concert. July 13, 2016. Limburg Newspaper, by Ronald Colé: Maastricht citizen Frank Steijns (45) is the city carillon player and is also violinist with the Johann Strauss Orchestra. "Everything in my life revolves around music." You don't expect it: The image you have of a carillon player is that of a lonely old man who painfully climbs the stairs of a church tower to practice an ancient and dying profession, just for a tip. That is not true in the case of Frank Steijns from Maastricht. Born in Bilzen, he has not only been the Maastricht city carillon player since 1997, the 13th in the row since 1672, but is also carillon player for the towns of Weert and Heerlen. And a very good one too! He does not play standard tunes like "Tulips from Amsterdam" or "the Big Ben", no, he also plays current day hits.. When David Bowie passed away "Heroes" rang out over the Vrijthof, and with the 50th anniversary of the Rolling Stones, "Lady Jane" echoed over the Market. Last week with a tenor and a mezzo soprano, he strewed about the city of Weert the music of Westside Story. And recently during the Booch Festival in Heerlen, heavy metal music could be heard from the church tower. Steijns was 5 years old when he was first allowed to enter the tower of the St. Servaas cathedral with his father Mathieu, to use the new carillon. "In a nice white sailor's suit. Afterwards, when I left the tower it had turned pitch-black, but I knew that my future profession would be: a carillon player". Not really too trendy for a little boy, overweight with glasses and a violin. But that did not bother him. "You just have to do your own thing in life". The English say it so nicely: "If you do what you love, you'll never work a day in your life". I wholeheartedly agree with that. After secondary school, Steijns choose the Conservatory in Leuven (Belgium), where he studied both violin, music theory and orchestra management, followed by the Royal carillon school in Mechelen. He had hardy received his certificates, when André Rieu called him. Early in the morning at 7.30 AM, the day after my graduation. He was looking for a violinist who could join him the same evening in Nijmegen, where the Four Days Walk festivities were taking place, and asked me if I would like to join him. I said "Yes" and I never left him. So hot! In the meantime Steijns has developed as a Jack-of-all-trades within the Johann Strauss Orchestra. He is not only a first violinist, but also a replacement pianist during performances, and he accompanies the singers on the piano during rehearsals, assists with writing arrangements, and composes waltzes and other new music pieces together with the orchestra's conductor. Besides that I update the website and I am the in house photographer for the orchestra. André rather likes that, because I know exactly when I can or cannot take pictures. The question arises as where he finds the time to do all these things. Besides traveling the world 150 days per year with the Maastricht standalone violinist he also performs some 175 carillon concerts per year. Everything I do has to do with music, therefore it is no effort. Besides I can do it at my own leisure. If my body requires it, I take some rest. Actually, when we are on tour, I just have to perform between 8 and 11 PM. So what stops me during the day from visiting a museum, or taking a nap? Or read a book with an headset on? But it is true that I lead an intense life. Outside the André Rieu concerts I drive about 45.000 kilometers (about 28,000miles) every 6 months in my own car. Not counting the train and plane travels. This is purely for my carillon job. Once I flew to New York, and back during one weekend, where at the prestigious Yale University one of my compositions for carillon and soprano premiered. Recently I went to a reunion of the conservatory of Leuven. Of the fifty students, there appeared to only be three who actually still sit on the stage. Yet he would not trade the life he lives for for all the gold in the world. I recently attended a reunion of my conservatory education class in Leuven. It occurred to me that only 3 music students out of 50 were actually still on stage, which included me. Amongst the others were many directors of music schools, a producer of Andrew Lloyd Webber and even a pilot! Don't even ask him to choose between his job as carillon player or violinist.. That is the same as having to chose between your father or mother. "An impossible choice." 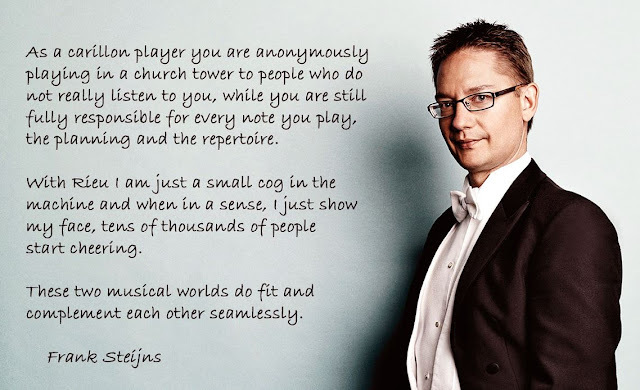 As a carillon player you are anonymously playing in a church tower to people who do not really listen to you, while you are still fully responsible for every note you play, the planning and the repertoire. With Rieu I am just a small cog in the machine and when in a sense, I just show my face, tens of thousands of people start cheering. These two musical worlds do fit and complement each other seamlessly. Frank Steijns would not want to trade the life he leads as carillonneur and Rieu violinist for anything in the world. Quietly he hopes that as a carillonneur he achieves the same success Rieu has achieved as an orchestra leader. On a smaller scale of course. "I have performed with André Rieu in a small theater with an audience of 200, and admire the vision he has: what works for 200 must also work for 2000. And if it works for 2000, than it must also work for 20.000. So if I am successful in touching 2 people with my carillon, then that must also to work with 20". Hence the tirelessness in which he continues to promote his instrument. "In the 18th and 19th century the carillon was the instrument of the ordinary people who could not afford a live Mozart or Offenbach concert. And it currently is still the same. And so recently I met a lady who emigrated in 1946 to Australia and had recently returned to the city of her birth, Maastricht, to attend a Rieu concert. The buildings were the same but she did not recognize the city any more. Until she walked over the St. Servaas Bridge and heard the carillon of City hall. Then she realized she was home. Doesn't that say enough? Frank est un garçon au grand talent, aussi bien au sein de l'orchestre d'André dont il est membre depuis de nombreuses années mais également comme carillonneur. Il est de plus un jeune homme sympathique, souriant et plein d'humour. Je lui souhaite une longue carrière, pour le plus grand plaisir des fans du JSO et autres. Francine. Must be hard for his wife to miss him so much, but I guess she knew what she got into when she married him. Frank doesn't wear a wedding ring by the way, maybe he wears it around his neck, like the maestro used to do?